How is surgery on De Quervain´s syndrome carried out? The image shows a surgical incision in connection with a procedure on De Quervain´s syndrome. 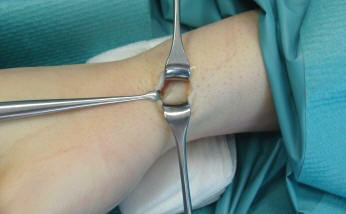 The procedure begins with an either w-shaped (see image) or transversal surgical incision. The image shows the well visible yellow fatty tissue. Veins as well as the superficially located radialis nerve run within the fatty layer of the skin (subcutaneous tissue). The image above shows the severed fatty layer and the external shell of the first extensor compartment. Deep down underneath the fatty layer lays the first extensor compartment. In case of De Quervain´s syndrome this canal is significantly thickened. The image shows the first extensor compartment after the fatty layer was positioned aside. 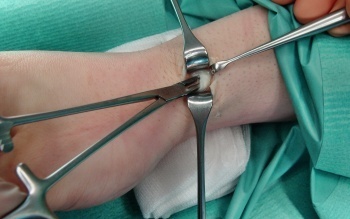 The image shows a clamp positioned within the first extensor compartment right underneath where the first extensor compartment will be separated. 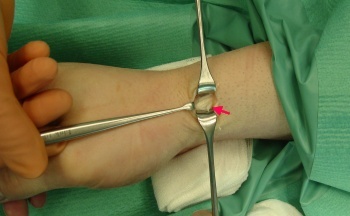 The image shows a clamp positioned within the first extensor compartment. The first extensor compartment is separated right above the clamp. 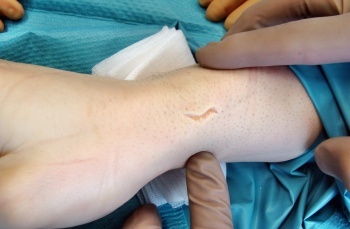 Skin suture at the end of De Quervain´s syndrome surgery.